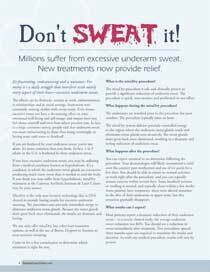 Millions suffer from excessive underarm sweat (hyperhidrosis). It’s frustrating, embarrassing and a nuisance. Excessive underarm sweat is a daily struggle, and it can interfere with nearly every aspect of your life. Excessive underarm sweat can cause anxiety at work, embarrassment in relationships and social settings, and frustration over constantly ruining clothes with sweat stains. Excessive sweat can also have devastating effects on your emotional well-being and self-image, and impact how you feel about yourself and even how others perceive you. In fact, in a large consumer survey, people said that underarm sweat was more embarrassing to them than being overweight, having acne, cold sores or dandruff. If you have excessive underarm sweat, you may be suffering from a medical condition known as hyperhidrosis. It's a condition in which the underarm sweat glands are overactive, producing much more sweat than is needed to cool the body. If you think you may suffer from hyperhidrosis, Miradry treatment at the Gateway Aesthetic Institute & Laser Center, may be your answer. 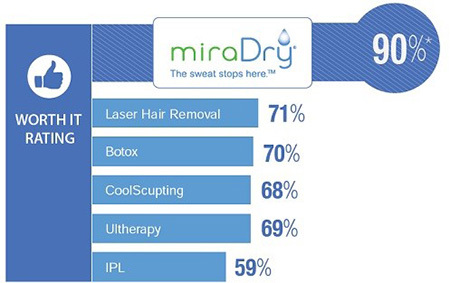 MiraDry is the only non-invasive technology that is FDA cleared to provide lasting results for excessive underarm sweating. The procedure use precisely controlled energy to eliminate underarm sweat glands. Because the sweat glands don’t grow back once eliminated, the results are dramatic and lasting. Come in for a free consultation to determine if MiraDry is right for you. We will explain all of your treatment options. (Not only miraDry, but also laser treatment options as well as the use of Botox, Dysport or Xeomin to treat excessive sweating. Call us today at 801-595-1600.